Roman Emperor Antoninus Pius ordered the construction of the Antonine Wall around 142. Quintus Lollius Urbicus, governor of Roman Britain at the time, initially supervised the effort, which took about twelve years to complete. The wall stretches 63 kilometres (39 miles) from Old Kilpatrick in West Dunbartonshire on the Firth of Clyde to Carriden near Bo'ness on the Firth of Forth. The wall was intended to extend Roman territory and dominance by replacing Hadrian's Wall 160 kilometres (99 miles) to the south, as the frontier of Britannia. But while the Romans did establish many forts and temporary camps further north of the Antonine Wall in order to protect their routes to the north of Scotland, they did not conquer the Caledonians, and the Antonine Wall suffered many attacks. The Romans called the land north of the wall Caledonia, though in some contexts the term may refer to the whole area north of Hadrian's Wall. The Antonine Wall was shorter than Hadrian's Wall and built of turf on a stone foundation, but it was still an impressive achievement. It was also a simpler fortification than Hadrian's Wall insofar as it did not have a subsidiary ditch system behind it to the south, as Hadrian's Wall did with its Vallum. The stone foundations and wing walls of the original forts on the Antonine Wall demonstrate that the original plan was to build a stone wall similar to Hadrian's Wall, but this was quickly amended. As built, the wall was typically a bank, about four metres (13 feet) high, made of layered turves and occasionally earth with a wide ditch on the north side, and a military way on the south. The Romans initially planned to build forts every 10 kilometres (6 miles), but this was soon revised to every 3.3 kilometres (2 miles), resulting in a total of nineteen forts along the wall. The best preserved but also one of the smallest forts is Rough Castle Fort. In addition to the forts, there are at least 9 smaller fortlets, very likely on Roman mile spacings, which formed part of the original scheme, some of which were later replaced by forts. The most visible fortlet is Kinneil, at the eastern end of the Wall, near Bo'ness. There was once a remarkable Roman structure within sight of the Antonine Wall at Stenhousemuir. This was Arthur's O'on, a circular stone domed monument or rotunda, which may have been a temple, or a tropaeum, a victory monument. It was demolished for its stone in 1743, though a replica exists at Penicuik House. In addition to the line of the Wall itself there are a number of coastal forts both in the East (e.g. Inveresk) and West (Outerwards and Lurg Moor), which should be considered as outposts and/or supply bases to the Wall itself. In addition a number of forts farther north were brought back into service in the Gask Ridge area, including Ardoch, Strageath, Bertha (Perth) and probably Dalginross and Cargill. RIB 2193. Distance Slab of the Second Legion George MacDonald calls in no. 6 in the 2nd edition of his book The Roman Wall in Scotland. He says it was found near the farm at Summerston on the banks of the Kelvin. It has been scanned and a video produced. Recent research by Glasgow University has shown that the distance stones, stone sculptures unique to the Antonine Wall which were embedded in the wall to mark the lengths built by each legion, were brightly painted unlike their present bare appearance. These stones are preserved in the University's museum and are said to be the best-preserved examples of statuary from any Roman frontier. Several of the slabs have been analysed by various techniques including portable X-ray fluorescence (pXRF). Tiny remnants of paint have been detected by surface-enhanced Raman spectroscopy (SERS). Several of the distance slabs have been scanned and 3-D videos produced. There are plans to reproduce the slabs, both digitally and in real physical copies, with their authentic colours. A copy of the Bridgeness Slab has already been made and can be found in Bo'ness. It is also expected that lottery funding will allow replicas of distance markers to be placed along the length of the wall. The wall was abandoned only eight years after completion, when the Roman legions withdrew to Hadrian's Wall in 162, and over time may have reached an accommodation with the Brythonic tribes of the area, whom they may have fostered as possible buffer states which would later become "The Old North". After a series of attacks in 197, the emperor Septimius Severus arrived in Scotland in 208 to secure the frontier, and repaired parts of the wall. Although this re-occupation only lasted a few years, the wall is sometimes referred to by later Roman historians as the Severan Wall. This led to later scholars like Bede mistaking references to the Antonine Wall for ones to Hadrian's Wall. In the centuries since the Antonine Wall lay abandoned it had an influence over culture between the Forth and the Clyde. The islanders built the wall which they had been told to raise, not of stone, since they had no workmen capable of such a work, but of sods, made it of no use. Nevertheless, they carried it for many miles between the two bays or inlets of the sea of which we have spoken; to the end that where the protection of the water was wanting, they might use the rampart to defend their borders from the irruptions of the enemies. Of the work there erected, that is, of a rampart of great breadth and height, there are evident remains to be seen at this day [AD 730]. It begins at about two miles distance from the monastery of Aebbercurnig [Abercorn], west of it, at a place called in the Pictish language Peanfahel, but in the English tongue, Penneltun [Kinneil], and running westward, ends near the city of Aicluith [Dumbarton]. [the departing Romans] thinking that it might be some help to the allies [Britons], whom they were forced to abandon, constructed a strong stone wall from sea to sea, in a straight line between the towns that had been there built for fear of the enemy, where Severus also had formerly built a rampart. Bede obviously identified Gildas' stone wall as Hadrian's Wall, but he sets its construction in the 5th century rather than the 120s, and does not mention Hadrian. And he would appear to have deduced that the ditch-and-mound barrier known as the Vallum (just to the south of, and contemporary with, Hadrian's Wall) was the rampart constructed by Severus. Many centuries would pass before just who built what became apparent. In medieval histories, such as the chronicles of John of Fordun, the wall is called Gryme's dyke. Fordun says that the name came from the grandfather of the imaginary king Eugenius son of Farquahar. This evolved over time into Graham's dyke – a name still found in Bo'ness at the wall's eastern end – and then linked with Clan Graham. Of note is that Graeme in some parts of Scotland is a nickname for the devil, and Gryme's Dyke would thus be the Devil's Dyke, mirroring the name of the Roman Limes in Southern Germany often called 'Teufelsmauer'. Grímr and Grim are bynames for Odin or Wodan, who might be credited with the wish to build earthworks in unreasonably short periods of time. This name is the same one found as Grim's Ditch several times in England in connection with early ramparts: for example, near Wallingford, Oxfordshire or between Berkhamsted (Herts) and Bradenham (Bucks). Other names used by antiquarians include the Wall of Pius and the Antonine Vallum, after Antoninus Pius. Hector Boece in his 1527 History of Scotland called it the "wall of Abercorn", repeating the story that it had been destroyed by Graham. 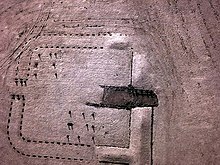 An infra-red aerial photograph of Kinneil Roman Fortlet, near Bo'ness at the eastern end of the Antonine Wall. 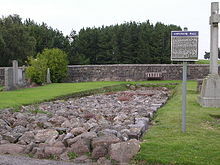 The UK government's nomination of the Antonine Wall for World Heritage status to the international conservation body UNESCO was first officially announced in 2003. It has been backed by the Scottish Government since 2005 and by Scotland's then Culture Minister Patricia Ferguson since 2006. It became the UK's official nomination in late January 2007, and MSPs were called to support the bid anew in May 2007. 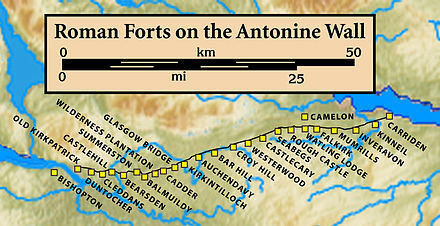 The Antonine Wall was listed as an extension to the World Heritage Site "Frontiers of the Roman Empire" on 7 July 2008. Though the Antonine Wall is mentioned in the text, it does not appear on UNESCO's map of world heritage properties. All sites are unmanned and open at all reasonable times. The first capable effort to systematically map the Antonine Wall was undertaken in 1764 by William Roy, the forerunner of the Ordnance Survey. He provided accurate and detailed drawings of its remains, and where the wall has been destroyed by later development, his maps and drawings are now the only reliable record of it. Modern computer techniques like using GIS can now map the wall in 3-dimensions which makes it much easier to study for example how visible forts and fortlets were to their fellow soldiers along the wall. The Antonine Wall is mentioned in Max Brooks' novel World War Z: An Oral History of the Zombie War (2006) as the last line of defence in Great Britain against the zombies. The Northern Wall is also depicted in some of Rosemary Sutcliff's historical fiction novels: as a fully functioning outpost of Roman power in The Mark of the Horse Lord (1965) and as an abandoned ruin in Frontier Wolf (1980). Finds from the Antonine Wall in the Hunterian Museum in Glasgow. ^ Krakowka, Kathryn (24 April 2018). "Meticulous metric survey of the Antonine Wall". Current Archaeology. Retrieved 28 April 2018. ^ Elliott, Simon; Hughes, Tristan (18 March 2018). "The Scottish Campaigns of Septimius Severus". Turning Points Of The Ancient World. Retrieved 21 May 2018. ^ "The Antonine Wall Management Plan 2014-19" (PDF). Antonine Wall. Retrieved 28 April 2018. ^ Robertson, Anne S. (1960) The Antonine Wall. Glasgow Archaeological Society. p. 7. ^ Breeze, David J. (2006) The Antonine Wall. Edinburgh. John Donald. ISBN 0-85976-655-1 p. 167. ^ Hunter, Fraser; Carruthers, Martin. "ScARF Summary Roman Presence Report" (PDF). Scottish Heritage Hub. Retrieved 28 April 2018. ^ Kent, Emerson. "Alternative Map of the Wall". Retrieved 7 May 2018. ^ "RIB 2193. Distance Slab of the Second Legion". Roman Inscriptions of Britain. Retrieved 18 November 2017. ^ Macdonald, Sir George (1934). The Roman wall in Scotland, by Sir George Macdonald (2d ed., rev., enl., and in great part rewritten ed.). Oxford: The Clarendon press. p. 373–376. Retrieved 11 October 2017. ^ "Distance Slab of the Second Legion , Balmuildy". 28 May 2015. Retrieved 25 November 2017. ^ Brock, John F. "THE DISTANCE SLABS OF THE ANTONINE WALL : The Surveyors' Record Carved in Stone!" (PDF). International Federation of Surveyors. Retrieved 5 June 2018. ^ Krakowka, Kathryn (30 May 2018). "Reading the painting on the wall" (CA 340). Current Archaeology. Retrieved 30 May 2018. ^ Paterson, Kirsteen (3 October 2018). "Scotland's Roman heritage to be remembered with Antonine Wall installations". The National. Retrieved 6 October 2018. ^ Maldonado, Adrián (November 2015). "The Early Medieval Antonine Wall" (PDF). Britannia. 46: 225–245. doi:10.1017/S0068113X15000124. Retrieved 9 July 2018. ^ "An Additional DESCRIPTION OF THE ROMAN WALL, IN SCOTLAND". Retrieved 15 October 2017. ^ Camden, William (1722). Britannia, or, A chorographical description of Great Britain and Ireland, together with the adjacent islands (vol 2 ed.). London: Printed by Mary Matthews, for Awnsham Churchill, and sold by William Taylor ... pp. 1283–1292. Retrieved 9 October 2017. ^ "Roman wall builds heritage claim". BBC News. 22 February 2003. Retrieved 24 May 2007. ^ "Roman wall heritage bid backing". BBC News. 14 June 2005. Retrieved 24 May 2007. ^ "World Heritage bid hope for wall". BBC News. 20 June 2006. Retrieved 24 May 2007. ^ "World Heritage support for wall". BBC News. 23 January 2007. Retrieved 24 May 2007. ^ "MSPs called to support Roman wall". BBC News. 23 May 2007. Retrieved 24 May 2007. ^ "Wall gains World Heritage status'" BBC News. Retrieved 8 July 2008. ^ "BARHILL ROMAN FORT". castles forts battles. Retrieved 13 August 2016. ^ "CASTLECARY ROMAN FORT and CASTLECARY TOWER". castles forts battles. Retrieved 13 August 2016. ^ "ROUGH CASTLE". castles forts battles. Retrieved 13 August 2016. ^ "Rough Castle to Castlecary". Antonine Wall. Retrieved 3 July 2017. ^ "OS Six Inch 1st edition, 1843-1882". National Library of Scotland. Ordnance Survey. Retrieved 3 July 2017. ^ Hübner, Emil (1886). "The Roman Annexation of Britain". In Hodgkin, Thomas (ed.). Archaeologia Aeliana. New. XI. Newcastle-Upon-Tyne: Society of Antiquaries of Newcastle upon Tyne. pp. 82–116. ^ Dyčka, Michal (2016). "To See and to be Seen – the Antonine Wall in the Context of Spatial Analysis" (PDF). Studia Hercynia. 20 (2): 40–46. Retrieved 9 July 2018. ^ Sutcliff, Rosemary (1980). Frontier Wolf. Wikimedia Commons has media related to Antonine Wall.